I’ve always liked La Colombe, the Philadelphia-based chain, ever since visiting the amazing Dilworth Plaza branch near Philadelphia’s City Hall. I’ve now visited a number of branches, and, other than the coffee, they all have one thing in common: they occupy amazing physical spaces. This is something that La Colombe shares with the UK’s Boston Tea Party: taking iconic buildings and turning them into amazing coffee shops. Like the Boston Tea Party, La Colombe manages the trick of making each branch simultaneously its own place and yet obviously a La Colombe. In this respect, the Wicker Park branch, one of four (soon to be five) in Chicago, is no different. Almost directly underneath the elevated Blue Line, which thunders above Milwaukee Avenue, La Colombe is opposite Damen station, occupying a large, rectangular building with a glass front, high ceilings and exposed brick walls. Add in windows at the back and it’s a wonderfully light and airy space. There’s all the usual La Colombe goodness, with multiple choices on espresso, bulk-brew and pour-over. All the coffee is roasted in-house, in a facility a few blocks from the coffee shop which supplies all La Colombe’s Mid-west outlets. There’s also loose-leaf tea and a range of cakes/pastries. La Colombe’s Wicker Park branch was its second in Chicago, following on from the West Loop. When I visited towards the end of 2016, there were three, but by 2017, that had risen to four, with a fifth added in 2018. The Wicker Park branch is not hard to find: head for the Blue Line’s Damen station just off Milwaukee Avenue and there it is, almost directly under the tracks on the west side of Damen Avenue. Although a shady spot, the massive, all-glass front, plus windows at the back, means it’s bright inside. Given how horrendously noisy Chicago’s elevated railway can be, I worried about the sound levels inside La Colombe, but was pleasantly surprised. Although you can hear trains rumbling overhead, that’s all it is, a rumble. Put another way, the small pour-over grinders are noisier than the trains. La Colombe occupies a rectangular floor-plan, cut off at front on the right (it looks like a SIM card viewed from above). The door’s front left, the space organised around a large, rectangular counter which is almost an island, save for being attached to the right-hand wall. The kitchen is behind here, the wall itself housing another La Colombe trademark, a wonderful mural. The counter’s a rectangular horseshoe, long edges facing front and back. There’s seating around all three sides, starting with a six-seat communal table with bar-stools between counter and window. Against the left-hand wall, under a long, angled mirror, is a long, wooden bench with two end-seats, six square two-person tables in between. There’s a similar arrangement against back wall, while you can also sit opposite on one of five bar stools at the back of the counter. All the furniture, plus counter and floor, are wooden, giving the interior a wonderfully warm feel. You order at the front of the counter, where you’ll also find the obligatory drip flasks, cake and, on the right, pour-over area. The rear of the counter’s devoted to espresso, a three-group La Marzocco in the centre, flanked by two grinders to the left, one to the right (house-blend, single-origin and decaf). Another La Colombe feature are the water taps on the right-hand end of the counter, dispensing normal and sparkling water. Finally, the short side of the counter, facing the left-hand wall, is where you collect your drinks. Yes, sadly, it’s still counter service. Since I first visited La Colombe, it’s relented on its no-menus policy, but there’s still no Wifi (something I can respect). Other than cakes and a very small savoury selection, La Colombe has little in the way of food, but is happy for you to bring in food from outside, so I popped next door for a burrito while my coffee was being made. Talking of which, there’s a great selection. On espresso there’s the Nizza blend from La Colombe’s Classic range, with a Guatemala Hue Hue single-origin from the Workshop range. There’s another Workshop single-origin (a Mexican) on bulk-brew, joined by the Corsica blend. Finally, three single-origin pour-overs are available through the Silverton dripper. I was considering a decaf cortado but spotted a Myanmar single-origin on pour-over. Having never had coffee from Myanmar before, I felt obliged to try it. 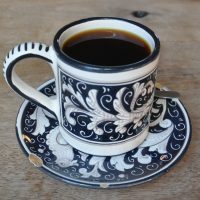 Served in one of La Colombe’s much-loved cups, with a matching saucer, it had a syrupy sweetness to it that was quite different from the (sweet) Peruvian pour-over I’d had at Buzz Killer Espresso earlier that day. Equally good at the bottom of the cup, when it was almost cold, it tasted even sweeter if that’s possible. On this basis, Myanmar should definitely grow more coffee! December 2017: La Colombe, Wicker Park was a runner-up for the 2017 Best Filter Coffee Award. You can also see what I made of all the other branches of La Colombe that I’ve visited. This entry was posted in Cafe/Roaster, Cake, Chicago, Coffee Shops, Evening Opening, La Colombe, Retailers, Stations Nearby and tagged AroundTheWorld2016, include, La Colombe by Brian Williams. Bookmark the permalink.